In 1824 the Mexican government granted to Elizabeth Tumlinson and her heirs the land and water rights to this area in the center of Stephen F. Austin's colony. The town of Columbus developed from a small frontier community. A fire in May 1883 destroyed a livery stable and hotel, threatening downtown Columbus to such a degree that the city council was spurred to action. The commissioner's court erected a water tower on the Courthouse Square and brick pump well-based on Spring Street. A water main with seven hydrants was laid around the business district that year and by December 1883 the city organized a fire department. Despite the fact that the water from the Colorado River processed through a filter before it was carried along the pipes to the citizens of Columbus, it was not always suitable for drinking. The city of Columbus contracted for an artesian well in September 1890. Work on the well was difficult and completion took six months because of several delays. The project was nearly abandoned. In 1909 there were about 100 consumers of the water from Columbus' public water well, which could hold about five hundred gallons at a time and was cut off each night. The river water was considered unfit for drinking. The city installed meters at this time. By 1912 the city faced a water shortage. 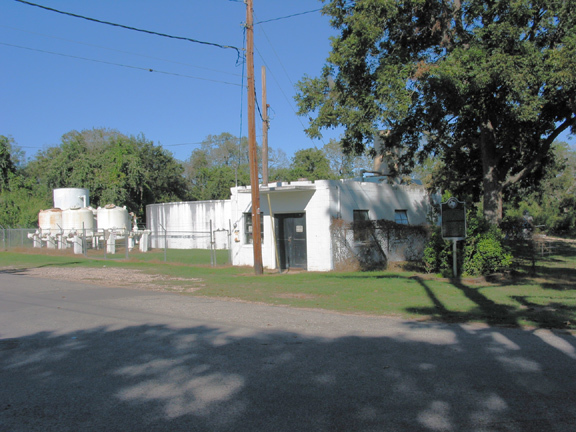 A new steel tower and reservoir were erected, though citizens continued to value at the artesian well for its purported purity and medicinal properties well into the 1930's.